Write in the answers to the following questions. 1. 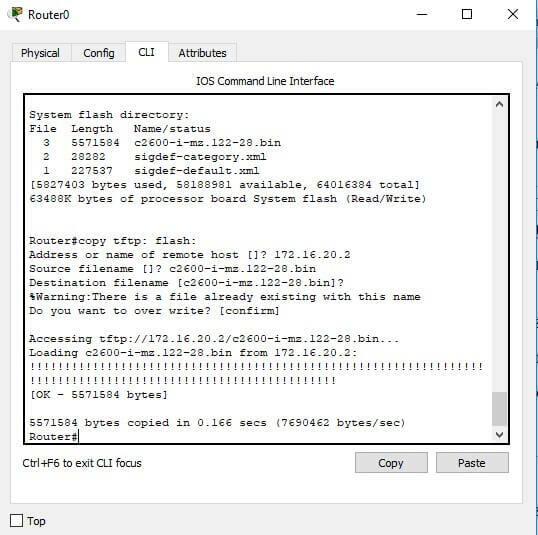 What is the command to copy a Cisco IOS to a TFTP host? 2. What is the command to copy a Cisco startup-config file to a TFTP host? 3. What is the command to copy the startup-config file to DRAM? 4. What is an older command that you can use to copy the startup- config file to DRAM? 5. What command can you use to see the neighbor router’s IP address from your router prompt? 6. What command can you use to see the hostname, local interface, plat- form, and remote port of a neighbor router? 7. What keystrokes can you use to telnet into multiple devices simulta- neously? 8. What command will show you your active Telnet connections to neighbor and remote devices? 9. 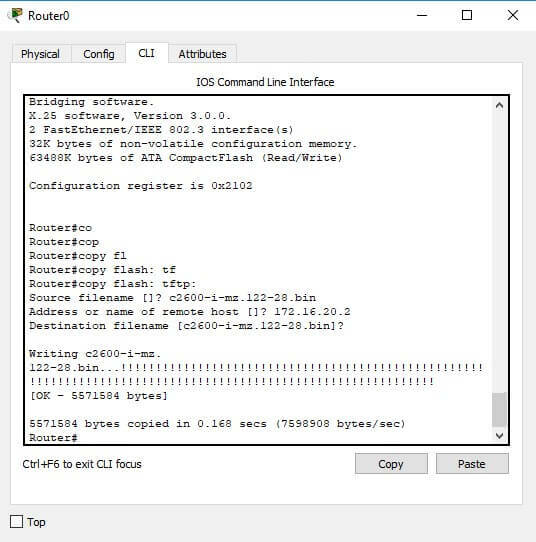 What command can you use to upgrade a Cisco IOS? 10. What command can you use to create a host table entry for Bob, using IP addresses 172.16.10.1 and 172.16.20.2? The RouterSim product, available from www.routersim.com, can perform all these labs. Log in to your router and go into privileged mode by typing en or enable. Type show version at the router privileged mode prompt to get the name of the IOS currently running on the If there is only one file in flash memory, the show flash and show version commands show the same file. Remember that the show version command shows you the file that is currently running, and the show flash com- mand shows you all of the files in flash memory. Once you know you have good Ethernet connectivity to the TFTP host, and you also know the IOS filename, back up your IOS by typing copy flash tftp. This command tells the router to copy the contents of flash memory (this is where the IOS is stored by default) to a TFTP host. If the file that was in flash memory is deleted, but the new version wasn’t copied to flash memory, the router will boot from ROM monitor mode. You’ll need to figure out why the copy operation did not take place. From Router B, type copy run tftp. Type the IP address of the TFTP host (for example, 16.30.2) and press Enter. The router will prompt you for a The hostname of the router is followed by the prefix –confg (yes, I spelled that correctly). You can use any name you want. The !! are UDP acknowledgments that the file was transferred suc- cessfully. From the router, type sh cdp and press Enter. You should see that CDP packets are being sent out to all active interfaces every 60 seconds and the holdtime is 180 seconds (these are the defaults). To change the CDP update frequency to 90 seconds, type cdp timer 90 in global configuration mode. Verify your CDP timer frequency has changed by using the command show cdp in privileged mode. Now, use CDP to gather information about neighbor routers. You can get the list of available commands by typing sh cdp?. Type sh cdp int to see the interface information plus the default encap- sulation used by the It also shows the CDP timer information. Type show cdp neighbor detail. Notice that it produces the same out- put as show cdp entry *. Type in Router B’s IP address from Router A’s command Notice that the router automatically tries to telnet to the IP address you specified. You can use the telnet command or just type in the IP address. From Router B, press Ctrl+Shift+6, then X to return to Router A’s command Now telnet into your third router, Router C. Press Ctrl+Shift+6, then X to return to Router A. 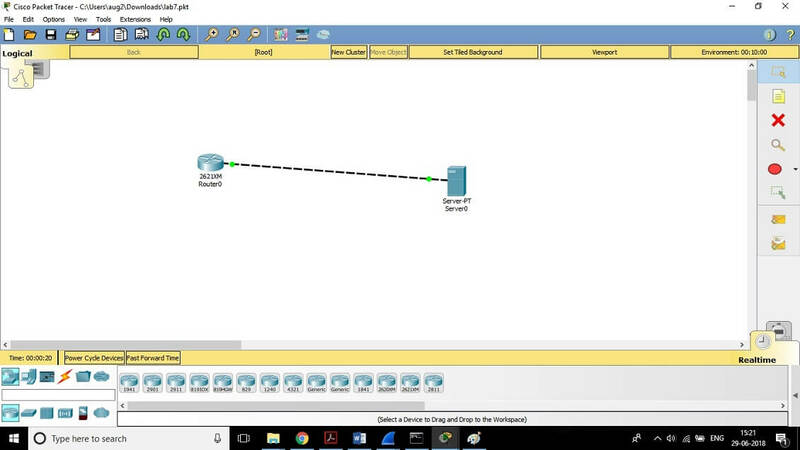 Go to the Router C’s console port by typing show sessions on the first router and using the connection number to return to Router Type show user and notice the connection to your first router, Router A. Type clear line to disconnect the Telnet session. From Router A, type todd and press Enter at the command Notice the error you receive and the delay. The router is trying to resolve the hostname to an IP address by looking for a DNS server. You can turn this feature off by using the no ip domain-lookup com- mand from global configuration mode. 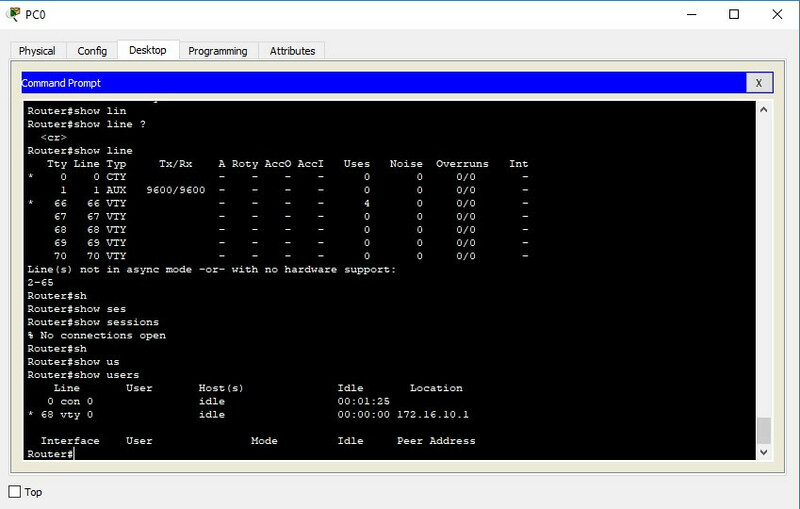 Test your host table by typing ping routerb from the command prompt (not the config prompt). Test your host table by typing ping routerc. 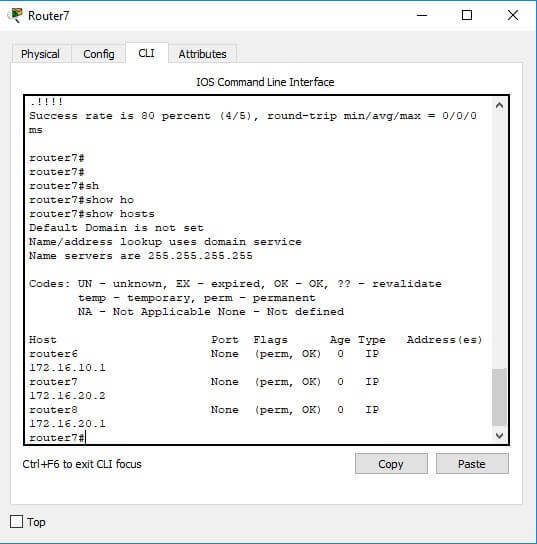 Keep your session to Router B open, and then return to Router A by pressing Ctrl+Shift+6, then X.
Telnet to Router C by typing routerc at the command prompt. Return to Router A and keep the session to Router C open by pressing Ctrl+Shift+6, then X. View the host table by typing show hosts and pressing Enter. 1. Which command will show you the hostname resolved to the IP address on a router? 2. Which command will copy the IOS to a backup host on your network? 3. Which command will copy a router configuration stored on a TFTP host to the router’s NVRAM? 4. To copy a configuration from a TFTP host to a Cisco router’s DRAM on your network, what two commands can you use? 5. Which memory in a Cisco router stores packet buffers and routing tables? 6. Which of the following is the correct command to create a host table on a Cisco router? 7. What command will allow you to see the connections made from your router to remote device? 8. Which command will show the CDP-enabled interfaces on a router? 9. What is the default update timer and holdtime for CDP? 10. To copy a configuration from the Cisco router’s DRAM to a TFTP host on your network, what command can you use? 11. If you want to have more than one Telnet session open at the same time, what keystroke combination would you use? 12. Which of the following commands will give you the same output as the show cdp neighbors detail command? 13. What does the command cdp timer 90 do? 14. Which command disables CDP on an individual interface? 15. Which command is used to find the path a packet takes through an internetwork? 16. 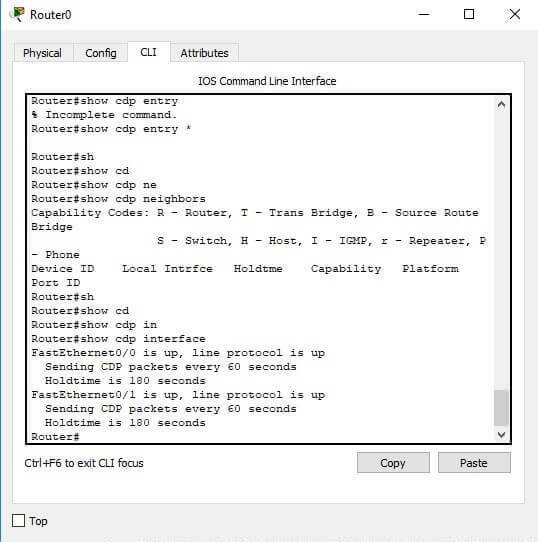 Which two commands can be used to test IP through your network? 17. 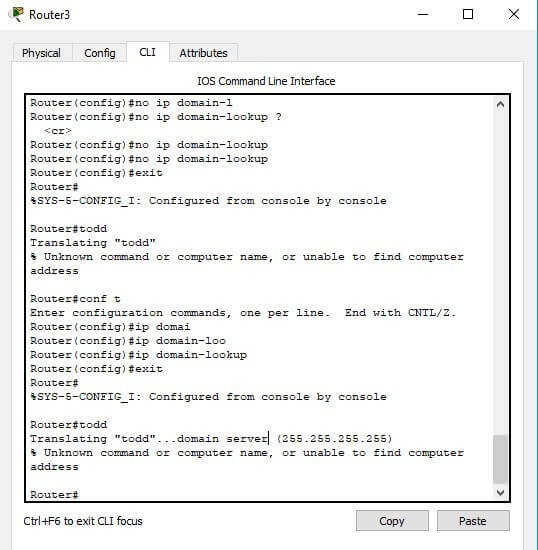 Which command will clear a connection to a remote router? 18. Which command will clear a VTY connection into your router? 20. Which command can you use to copy a new IOS into a router?